As the days get shorter and the nights get chillier here in the San Francisco Bay Area, the garden is putting on its unique autumn attire. Our autumn color may come later than in other climates, but it still comes nonetheless. And I love it when it does. It all happens in time for Thanksgiving and that makes it even more special. In the spring this hydrangea is a pure white. 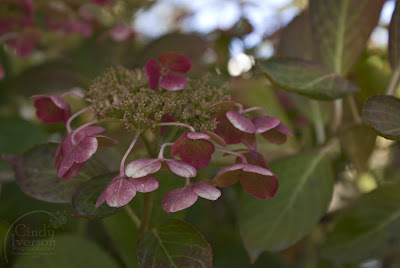 But with the onset of autumn the petals of the blooms as well as the leaves don a wonderful deep pink. It's as if nature is burnishing them with the deep russet tones of autumn as decor for the upcoming Thanksgiving holiday. Alone and less fantastic than its summer siblings, an autumn "Abraham Darby" bloom still puts on a show in front of the reddened hydrangea. My puzzling "Princess Di" bower vine (that's only "supposed" to bloom from May to June), still has many white blooms on it that look enchanting in the November light. I was taking shots of this blossom when suddenly this bee zips in to grab a snack. I clicked the shutter just in time before the bee took off again. Click on the image to see the bee and its silhouette larger. Well, I decided to leave them on the tree and now I've got a nice crop of what I'm calling "encore apples"! They aren't very big yet. But I figure that most apple trees like cooler weather and these apples may get big enough so that by the time we have our first frost some time in December, they'll be ready for harvesting. 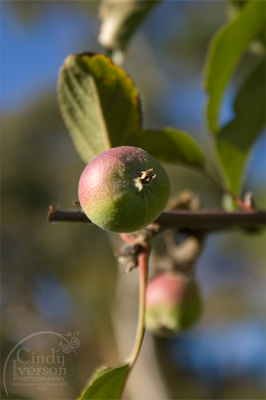 Hubby and I were actually able to harvest one apple off this tree from the first batch of the year. It was the first time we've ever been able to eat anything from the tree. It was a very nice and delicious little Pippin. Holy cow, you're kidding! Abraham Darby is my favorite, too! I just adore it. I have had one everywhere I have lived since discovering it. The smell! The quantity of petals! The color! sigh . . .
Hey Cindy, Your garden looks pretty fabulous in her autumn outfit! I was gazing out into my own garden yesterday morning and things are pretty dead by now), but I did see something that made me smile. I saw a little squirrel snooping around our yard (we don't usually have any in our area, not big enough evergreens yet), so I sneaked a handful of peanuts from Rick's personal stash and set them out on a slate rock in case the squirrel came back. Although I didn't see my bushy-tailed friend again, I watched as a big beautiful magpie 'squirreled' away the stash of peanuts, hiding them one by one under a mound of moldering leaves. When he'd stored a couple, he took another in his beak and flew off -- it was probably coffee break time! 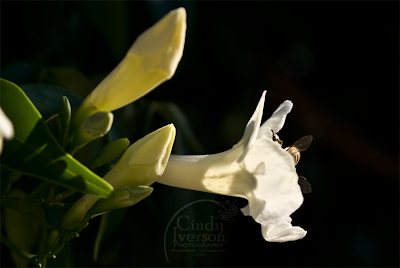 Cindy, I love the bee in the bower vine blossom. What a serendipitous shot! I can see why that rose is your favourite. I love the pink ones with just a bit of yellow/apricot mixed in. Great photo of the bee!! My hydrangeas are a lovely shade of brown....they once were white. I love Abraham Darby also, oh and Graham Thomas? the pale yellow one, love it. Great capture of the bee. I've been enamored with Iceberg lately. I bought one for the back garden in the spring and have watched its blooms all summer. I still have a few buds ready to open! How weird, huh? Autumn lookings lovely in your yard! The BEE flower shot was bee-utiful! I found your blog through Kitchen Ditcher. Anyway, a kindred spirit! Abraham Darby is one of my favorites too. I also adore 'The Impressionist', 'Polka' and 'The Alchemist'. There's an amazing rose company in Oregon (Heirloom Roses in St. Paul) that only works with the old fashioned roses. 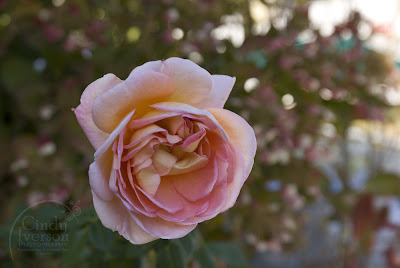 Their display gardens have to be one of the most amazing places on earth when the roses are in full bloom. That's where I fell for Mr. Darby. Not much left of my flowers in this colder climate but I'm certainly enjoying yours. Cindy, what WONDERFUL autumn garden pictures!